A Town is a place where you can perform many activities. Once you arrive in a town you can choose activities by clicking on the town icon that appears on the right side of your screen. Different towns will have different buildings available for various activities. Buy Potions to heal and resurrect your mercenaries in and out of battle. Open a bank account [Open Account]. Tax is chanrged on each deposit. The money in your bank account will be safe if you happen to die. Register to sell up to 12 items at a time with one additional slot opening every 10t level after level 90 up until Lv120. * A Bank Account is required to perform Market transactions. Teleport to other towns you've already visited. A service fee will be charged. 20% Will is required to Teleport. Apply for our guild to Control the Village by bidding Guild Points. 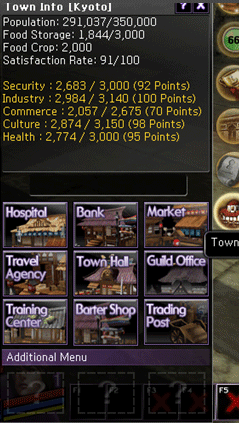 (Guild Points will be refunded if you do not receive control of the town - Minimum 1,000 Guild Points must be bid). The Guild with the highest bid will receive Control of the town at closing time. View information on your current Guild. View information on all other Guilds. Barter Elements for various items. A small fee is alrequired. Different Towns offer a selection of unique goods. Buy goods in one town and sell them to another town. Check the prices before deciding on a product to maximize profile. A [Trace Permission] license is required to use Trading Post. You gain 100 transactions at the Trading Post after using a Trade Permission. Battle monsters in time trial stages. Must be a member of a Guild to use the Training Center. Enter the Training Center with other Guild Members. View the Rankings of the Training Center to see the top Guilds. Practice PvP style combat against simulated opponents of varying levels for a fee. You can receive a maximum of 100 Fame Points through battles at the Sparring Hall. You can store items in the Warehouse at Rome. You can store up to 24 different items in the Warehouse at one time. Every time an item is retrieved from the Warehouse, you must pay a feel. Trace Permission is available for a fixed price on the Market. Usable by characters of Lv96 or higher only. A fee must be paid on every month from the Guild Fund to maintain a guild. You can check the current governing guild of a Town from the Town Hall in the Town Menu. Must be the Guild Leader or Chief Officer of a Guild. Must bid a minimum of 1,000 Guild Points. The guild with the highest bid of Guild Points will receive Control of the Village at closing time. All non-winning Guild Points bids will be returned. * Guild Points are gained when members level up, the guild crafts items, and Guild Quests are completed. Charge Service Fees for usage of Town Facilities. * Guild members can bring new residents to the Town and occasionally receive rewards when persuading wandering residents. More taxes will be due as the Town Population grows. The Town Population is affected by different Town Points including Security, Industry, Health, Commerce and Culture. Town population will decrease more rapidly if the satisfaction of its residents is low. Satisfaction rate can be increased by members of the Guild that owns the town through Town Quests. Town Quests function in the same way as Guild Quests but the rewards are generally greater. Each complete quest increases the satisfaction rate and Town Point values. Like Guild Quests, Town Quests require 1 Manager's Scroll to accept the quest. A Guild controlling a Town can construct or dismantle buildings in the Town. * Specific items are needed for building construction. Buildings can only be constructed through Guild Crafting. * Money must also be spent to construct buildings. The money must come from the Town Funds which can be checked at the Town Hall. The maximum level of security, industry, commerce, culture, and health of a town are affectged by the types of Buildings that are in the Town. The closer the points of each building type are to the maximum values the fewer residents will leave the town and the satisfaction rate will decrease at a reduced state.